Here's an update to my last post regarding my first case break adventure, and how poorly it went for me. Today I received my "consolation prize". It's the base card of Herschel from this set. The base cards are serial numbered to 99. The parallels are: Red- #'d to 49; Blue-#'d to 10; Gold-#'d to 5; and Platinum's which are 1 of 1's. If I don't think about the price I paid for this card, I'm pleased with it. 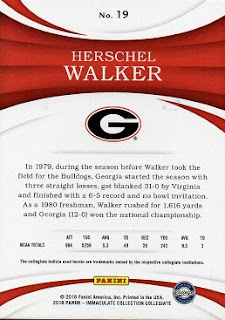 It's a Herschel card I didn't have, and it's from a brand new set. That said, I will never enter a case or box break auction again. I really think I had a better chance of actually playing in the N.F.L., than pulling, or rather, watching a guy pull, a high end Walker autograph, or memo. card. At first I was a little bitter, thinking perhaps, that the seller took advantage of me. But in hindsight, no body put a gun to my head and made me bid what I did. 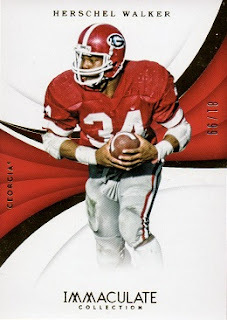 I certainly have overpaid for cards before, after all, cardboard has no intrinsic value. Instead of getting mad when I view this card, instead I will take it as a reminder of caveat emptor.